The above image is an example of severe abrasive wear. Abrasive wear occurs when foreign or abrasive particles in the resin come into contact with the screw or barrel. The scouring effect of the hard particles wears away the metal in the screw or barrel, most often in the transition section of the screw. Foreign particles such as screw flight particles, chrome plating and other objects can also gouge the barrel or screw or even break segments out of the screw flights. The abrasive particles in the resins can be reinforcements, such as glass fibers or spheres, calcium carbonate and powdered metals or ceramics. All will cause abrasive wear, especially if the components are not made from high quality wear resistant materials. Abrasive wear can also occur when processing non-reinforced materials if too much of the energy required to melt the resin is generated by shear. 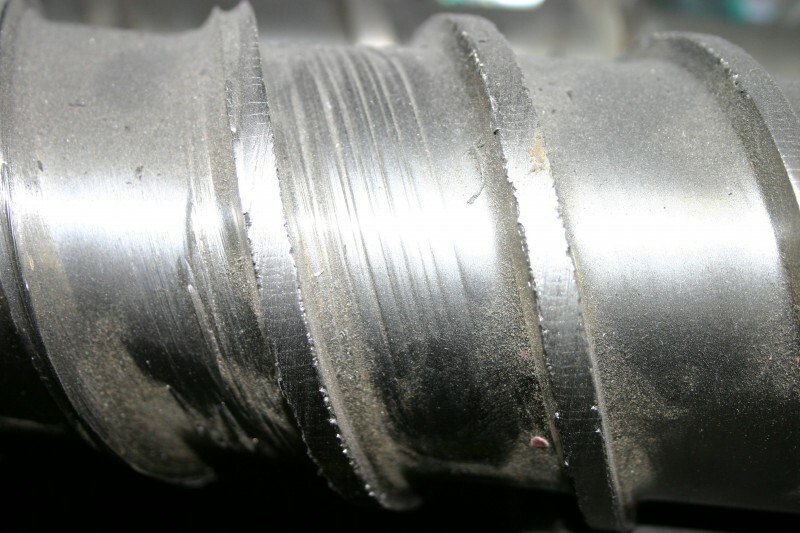 Cold pellets moving into the transition section of the screw are compressed and sheared causing a scrubbing action that results in abrasive wear.